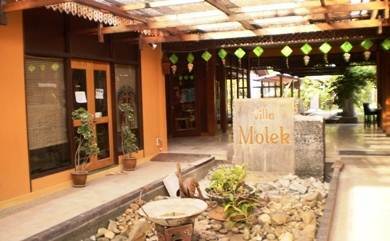 If you are looking for a mid-range (like 3 star) accommodation in a home like ambience yet enjoying modern amenities, nice comfort & luxury, good food and excellent service, then Villa Molek which is more like a boutique hotel could be the choice for you. It is an adult only accommodation and children below the age of 18 are not allowed. The owners have taken this step to ensure that peace and serenity of the place are not disturbed. This property with 12 beautifully appointed villas is located in Pantai Tengah, close to the south western end of the island. While the access to the property is from the main road of Pantai Tengah (i.e. from Jalan Teluk Baru), it's tucked in a quaint garden setting a bit off the road. It offers much needed tranquility which is difficult to get in this area which is surrounded by so many shops and restaurants. As you leave your taxi near the entrance and get into the nice cozy reception area, you are likely to be pleased with the smiling friendly staff who will help you with the check in formality and show you the room. The rooms are either in the ground floor or upper floor of the villas. Actually all accommodations are suites with separate bedroom, living room, a kitchenette and bathroom. There is an attached balcony with every suite with rattan chairs to relax on. The villas are designed to offer Malaysian style living experience although they have all modern amenities. All villas face the small lap pool surrounded by lush tropical garden. Sitting on the upper floor balcony, you get a lovely view of the garden, the pool, and over the fence the green paddy field where often you can see cows grazing and beyond that a jade green hill. The overall setting is picturesque. You can hear and see many birds in the evenings including the hornbills. Further away is your villa from the reception, closer you are with the nature and the views. But that would mean some walk every time you come towards the reception area or get back to your room. Each suite is about 70sqm in size and quite spacious. The suites are all tastefully decorated by the owner herself. The bedrooms and living rooms have tick furnishing. Both are air conditioned and also have ceiling fan in case you want to circulate the air. The bedroom has king size four poster bed. There is also a dining table in the living room and a snack basket on it is filled up daily. The living room has comfortable sofas, TV, writing desk etc. The kitchenette is equipped with a full size fridge (we love it since we can stock our own drinks and food), electric kettle, sink etc. Four bottles of drinking water is provided everyday complementary. The toilet and bath are separate. The bathroom has both hand held shower and tropical skylight shower. Hair dryer is provided. The hotel also provides in-room flip flops and white robes. The buffet breakfast is complimentary. Everyday they serve fresh fruits, selections of bread, cereals, yogurts, eggs, bacons and sausages. While the menu may not be extensive, you can have a hearty breakfast and skip your lunch if you so wish. The in-house cafe serves nice Malay food. However there are couple of other restaurants (including an Italian restaurant) within the complex area. You can in fact order food at the Italian restaurant and the staff can bring it for you in the room or by the pool side. Other amenities in Villa Molek includes WiFi at the Cafe. If your room is close to the cafe (reception area), you can easily work on the WiFi from your room. However at the far end, the signal gets quite patchy. Although Villa Molek is not located by the beach side, the famous Pantai Tengah Beach is only about 300 meters from the property and about 5-7 minutes walk. You can view amazing sunset from the beach. In fact Pantai Cenang Beach is also within 10 minutes walk. You can also avail the following services at an additional charge: massage, breakfast served on the terrace or balcony, laundry service, shuttle to the town, airport transfers etc. 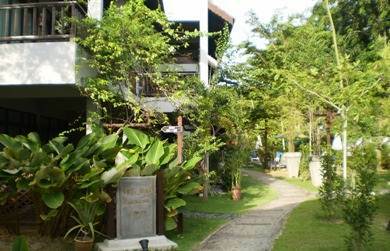 It's a wonderful property tucked in a prime location of Langkawi yet offering quiet serenity with its lush tropical garden. 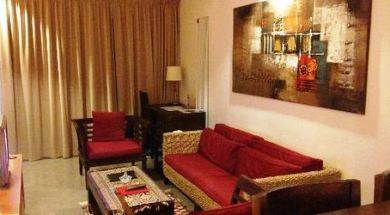 Villas are nicely appointed, very clean and well maintained. Staff behavior is excellent and they are very helpful. All amenities like souvenir shops, restaurants etc are with easy walking distance. Overall it's a good value for money. Wish there was assistance provided to the carry the luggage from the taxi to the rooms or the other way. From the farthest villas, that could require some effort. A property of such stature should consider offering this service. If you are at the ground floor, while you have easy access to the garden and the pool, there may be geckos getting through the glass doors that open out to the patio. And they can be noisy as well as a nuisance. The pool is really a small lap pool with hardly any depth. While the trees all around provide welcome shades, the water is often littered with leaves and looks unclean. From the southern end of Pantai Cenang when you take a turn towards the main road leading to Pantai Tengah, Villa Molek will be on the left after a short distance. It is about 15 minutes by car from Langkawi International Airport.